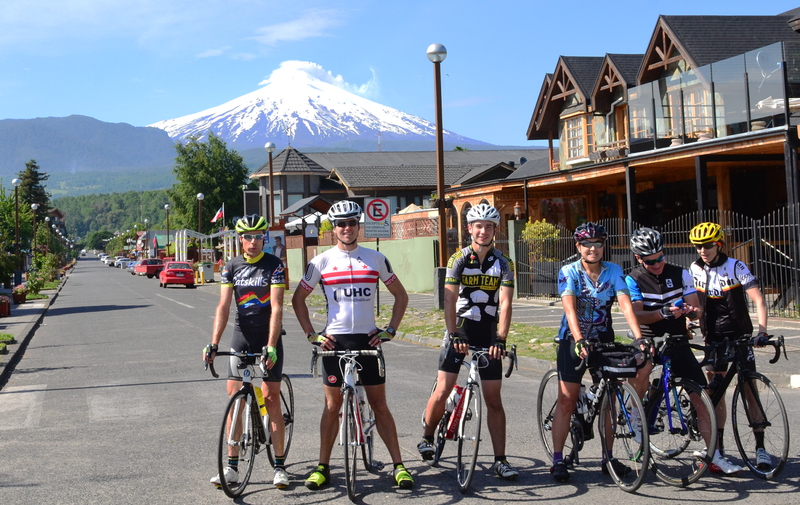 A seven day Tour from Pucon to Puerto Varas, Chile in 727 km covering 8300 m elevation gains in various hills, rollers and climbing Volcano Osorno. This was the "inaugural" Beta Tour of "Cycle Chile" presented by Anthem Sports and first announced at the 2016 Tour of the Battenkill. And this was where it first got Py's attention following up on it and actually been part of the Beta Riders Team. As the date approached quickly while been busy at work Py put his stuff together pretty much as used to from previous self supported touring with his friend Beni in past years. However, due to the new unique location and opportunity to see a not yet seen part of "world" he opted to take a little more photo gear in particular having the chance to have bigger camera at hand here and there from the support vehicle. A few last minute minor unexpected complications packing the "Storck" in the travel case due to different setup, in particular the hydraulic line seams not to be so happy with tight bends needed to stow the handle bar away... few concerns, but all was finally good and no issue. Good and easy was that the electronic connectors simply can be unplugged! Taking the old 11-27 cassette proofed to be a good idea while riding most of the tour with the 11-25, for Osorno with sustained 10..15% and up to 20isch+% here and there the swap the day before was definitively not to be regretted. The travel was a long one and a with little tight seating, but smooth other wise. Only little unavoidable headache was the intermittent customs transfer of all the stuff in Santiago. But this is even worse in the US where every first "touch down" implies this procedure. Here only due to the fact that our small local flight destination was non international and no customs is available at Temuco. Finally out of the airport in Temuco we assembled at the curb with our over sized bike boxes. Nice very pleasant weather. And shortly Dieter, the Tour organizer, arrived with the Van to take us to the first Hotel Huincahue in Pucon what will be out base for setting up and the first two nights. 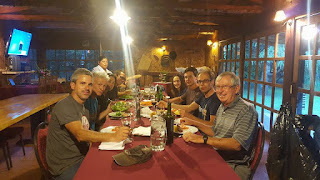 Meeting Wyatt, Dieters son and his Granddad and later Tyler who arrived already earlier that day in Pucon and will be Py's room mate. Finishing the day with a quick bike post assembly test ride together with Tyler just before our first dinner in Chile. Food so far was most excellent every where! That could be a very good reason to put this area high up on the best of destination to go for Py! From the Pucon Hotel Huincahue at Lago Villarrica with the dominant view of Volcano Vallarrica upstream along and up in a valley of Rio Liucura and a little beyond out designated point of return running out of the GPS track and followed by a happy Shepard like dog. At a seaming major point of end of climbing of the road we decided to stop and turn around. On the return a little side exploration without success finding some water falls, only making the way in and out on a coarse gravel road not been allowed or such to proceed to the falls -- so we returned later by Van to check them out. After that excursion dinner time in town -- so good once again. From Pucon to Panguipulli. A superb looking morning, clear sky, clean view of Villarrica with blue background. Rolln out of town after stowing all the luggage in the support vans. The first miles out of town were a little rough on some old road but improved after that and a rewarding landscapes were dominating the ride while our Volcano dominated the far view as we made out way part around it. Lunch at a nice lake site restaurant at the next major lake Lago Calafquén on our tour. The making our way part around that big lake on a scenic winding road. At some point we had to cut over a small pass to a smaller upper Lago Pullinque and encountered some rough dusty unpaved terrain for a few kilometers uphill and down hill -- road construction. That behind and almost at the end of our day's journey Tyler and Wyatt decided that little lake was a good spot for a impromptu stop and cool down... -- see the video above. Finally on the last miles [#2 double flat for Wyatt -- deciding to hop in the van for the remaining few km] and after a short local dirt road at the edge of the town we reached out destination of the day, Hotel/Cabins Puchaley Lafquén overlooking the Lago Panguipulli with the distant sight of Villarrica as seen with the southern sky at night below -- the little red dot at the horizon is the indirect shine of the active lava lake -- so cool to watch the pulsating shine of the volcano crest at night before bed time! Quick dip into the lake, then dinner time. From Panguipulli to Llifén. A unforgettable concert of a wild variety of birds and other creatures made the need for any alarm clock more than obsolete... good morning! Late breakfast and little slow getting out of town, traffic... so what, vacation! Py just quickly rolled down the dirt road waiting for the Vans... Climbing out of town with V in our back and owning the roads with little traffic... good times good views. Lunch at a restaurant overlooking Lago Ranco. From then a easy way to the Mavidue Lodge as part of a huge farm located in a gorgeous valley. Another very unique place with it's own special charm. Dinner or banquette "on site". 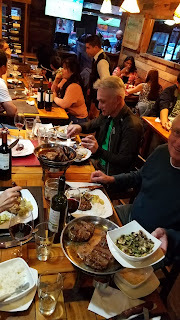 One more treat of superb quality beef, salads and great German style potatoes :) And not to forget some final sweet treats. Good night. After a break of almost 2 hours by that time finally on the road again for the longest day -- getting worried, getting late at that pace. 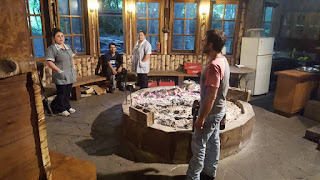 From Termas de Puyehue to Los Lingues Lodge in Puerto Octay. Starting with good breakfast leaving no wishes open along with a great view and some bird watching. Returning down the hill from the Termas to Lago Puyehue returning to Entre Lago heading South on a nice initially winding road with great vista of the Volcano landscape. Then some farmlands. A slight route modification due to unexpected a gravel road. From Los Lingues Lodge to Volcano Osorno. 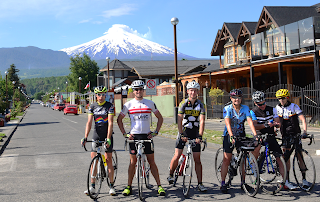 A short ride but a very scenic once with the only big climb up to Volcan Osorno on a beautiful quite and small road. Easy starting in a spectacular wilderness of flowers, bushes and trees on dark volcanic soil. Slowly increasing grade and at some point a long sustained climb at about 15% with a few steeps exceeding 20% briefly. Some odd magical deep forest, even the GPS was blocked at times! 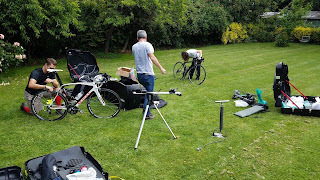 Py just maintaining a steady pace using his Compact/28 gearing most the time. Not killn it, but enjoying the landscape and snapping a pictures on the way. Lunch at the "base" ski lodge at the end of the road at about 1200m. Then a super fun and fast descent (see video below) before checking in at the Hotel las Cascadas. 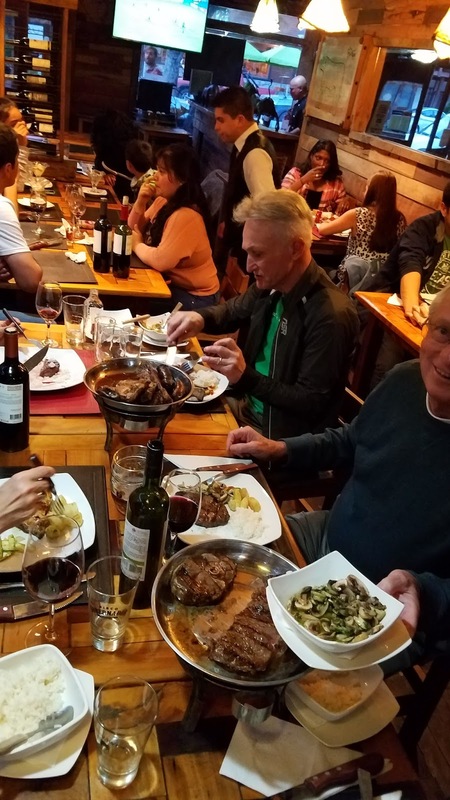 From Lodge las Cascadas to Puerto Varas. Nothing spectacular on the last day, part of the already seen road towards the Osorno climb but continuing around the lake to Puero Varas, Hotel Bellavista. The forcast called for some rain, rain at night but dried up roads at the start. About at the 1/2 way point the sky got darker and a first shower pored down on us. Py ignored this and kept going while a few opted for the Van. It temporary stopped raining and Tyler joined the road party again... but we got hit to the finish by another shower in town. However, last "tour" ride completed. And one more fine Tour dinner in town with lake view. Pizza time! And at end of day a final dinner with Drakes and Tyler while other already departed. Many thanks to Dieter for making this happen and his dad and Wyatt for the very welcoming and supportive atmosphere. Felt like a big family trip. And as Tyler used to say: "Beta Tours are the best!" No surprise = no extra fun! It's not a race, we were not on a tight schedule, we are flexible and can adjust on the spot -- that's the best -- at least for Py! "There is no such rock too big to not been moved out of the way or to get around."